A dry creek bed cut into your garden, mimicking a real, natural stream, can be either ornamental or functional. 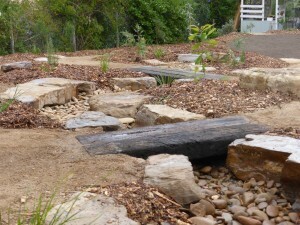 A functional dry creek bed is connected to your existing stormwater system, acting effectively as a rain garden. It takes water from your house roof when it rains, giving it a chance to percolate into the ground rather than rushing into our real creeks and rivers (which does some ecological damage). Our dry creek beds can finish with a bog garden, depression or wetland – an infiltration rain garden that provides yet another chance for the rainwater to infiltrate the soil. Doesn’t it make sense to use the water that falls for free on your roof? Dry creek bed with Dichondra repens. 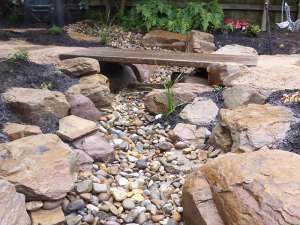 On the other hand, an ornamental dry creek bed isn’t connected to anything … it relies on the weather, and just looks great! 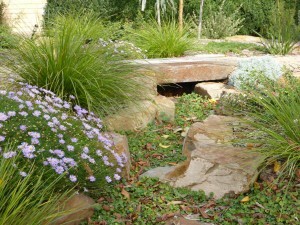 We can create different micro-climates within a dry creek bed. Plants that like to have wet feet, or at least more moisture than they would naturally get from rainfall, will thrive in a dry creek bed. So, within the same garden, there can be plants that like dry or well-drained conditions (planted on the top of mounds), and plants that like it wet (planted in the depressions). Dry creek beds are a good option if you want the look of a stream or creek, but without the extra expense of a fully-functioning pondless stream. Why not consider adding a beautiful bridge as well?